I'm glad you like it fvirgola80; after all, you're the reason I integrated the wind icons into the script. Corrected the distances in the new conkyrcs. Here is mine 1_accuweather with 3 different packs of icons .It stays in me more than has to choose which conky according to my humor. wherein the right Windrose in the "conkyweather-fonts" convinced me. I would say loutch has "The Teo Gold Medal" for accuweather conky ... I'm still working on mine. I tip my hat to loutch! AWESOME! Script #1-Unified Accuweather upgraded and updated. It now fully supports both the old and new Accuweather images, current conditions wind direction images and a few other minor upgrades. Read the documentation (1_REAME_INFO folder) for more information. Very nice job loutch, congratulations! YEAAAAAAAAAAA!!!!! And we move forward! Here the same conky with wunderground. I think it's my preferred . NICE! As for the medal - no it not too big! Sorry you didn't actually get it the other day but it had to be made. As a reference to the distribution of the great masters @TeoBigusGeekus. NICE one unklar. And on ARCH too! Very very cool! 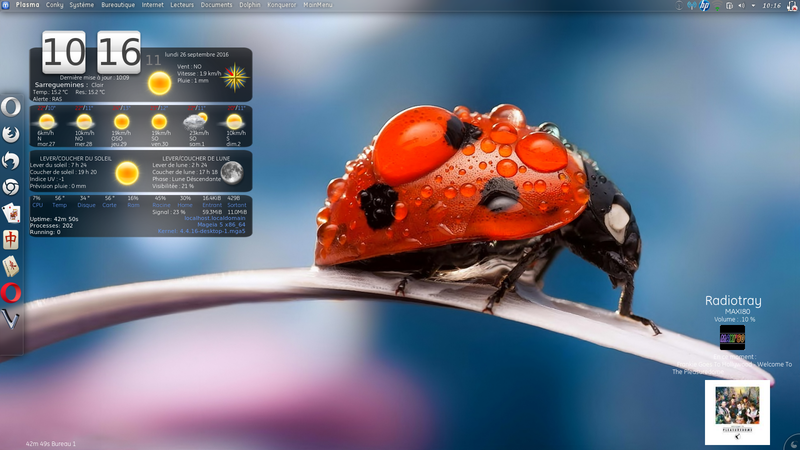 For those interested in it: The AccuWeather Current First and Last days Conky Companion. Basically it's a copy and paste version of Teo's PDF help file. NOTE: the "| cut -c-20" where the conky show long text for the forecast to keep things in line. Tested and corrected by unklar - Thank you! Post updated. EDIT: Code fot the conky v10 updated as per unklar's post below. Thank you unklar. Nice work S11, as always! Should I wait for you to incorporate the hourly file or should I link to your post from the first page? @ fvirgola80 - Thank you. Just doing my little part to support some great scripts. @ Teo - added an untested conky v10 using one of your default conkys as an example to the conky companion post above. As for the link, I'd add that now since it includes both conky v1.9 and v10. The Hourly conky will be up today with both versions of cony in it's own post. General strike here today, so everything is closed - therefore an uninterrupted free time day - almost like a vacation. LET'S CONKY!!!!!! As for the link, I'd add that now since it includes both conky v1.9 and v10. Thanks for your support and your contributions. [unklar@archhost ~]$ conky: Invalid value 'yes' for setting 'use_spacer'. Valid values are: 'none', 'left', 'right'. A top work! Thank you very much. Code in post above corrected .. thank you.